Add David Blatt, who maintains the OK Policy Blog, to the growing list of people who find flaws with proposed legislation that would allow outside health insurance companies to sell coverage exempt from state mandates. A second fallacy is that insurers are subject to a vast number of onerous mandates. 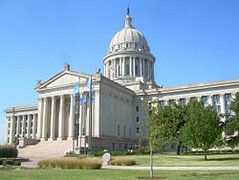 In reality, there are only a dozen or so benefits that must be offered in Oklahoma, and half of those apply only to group coverage or to specific categories of the population, such as children, seniors, or post-partum women. Most studies have found that the impact of mandates on the cost of coverage is quite minimal.
. . . interstate insurance sales would trigger a race to the bottom. Healthy Oklahomans may see lower prices and more choices. Older Oklahomans, those with medical conditions and small-business owners, however, would find insurance harder – if not impossible – to come by, with higher prices because of healthy people leaving the risk pool. The bill has been passed by a Senate committee and now heads for a full vote in the chamber. « On Assigning Blame, Or, "So, You Think I'm Retarded?"